NEAR WEST SIDE — New York Yankees All-Star centerfielder Curtis Granderson will fund a multi-million dollar baseball stadium at University of Illinois at Chicago, his alma mater. Granderson made the announcement Wednesday evening before attending a fundraising dinner held by UIC Baseball at 750 S. Halsted. The field will be named after Granderson. "I never thought I'd have my name on something like that," Granderson said Thursday night. Granderson said he still considers the UIC and the surrounding neighborhood special. 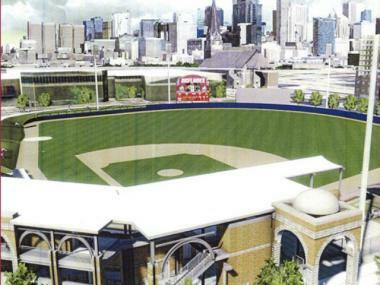 Rendering of the soon-to-be-built baseball stadium at University of Illinois at Chicago, which will be named after former Flames star Curtis Granderson. Construction on the new stadium, which doesn't have a final price tag and will have a turf field, will start in the fall with a two-year timetable. The stadium will feature about 1,200 chair-back seats and two grassy areas for spectator seating. In addition to being the UIC Flames home, the stadium also will host youth league games throughout the spring and summer. Two Major League Baseball programs — Reviving Baseball in Inner Cities and Urban Youth Academy — will partner up to sponsor Granderson’s youth initiative. "I started thinking about the decline in African-American players, so we said, 'How can we get the kids in our own backyards back playing baseball?'" said Granderson, whose No. 28 UIC baseball number was retired by the school Thursday. "And we figured that we've gotta get the kids started young. "We hope to have kids as young as 6, which is when I started playing, all the way to age 18 — and maybe one day we'll find that diamond in the rough." 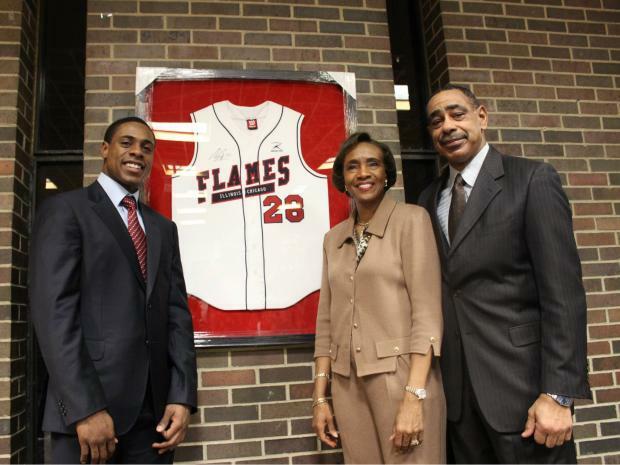 Granderson, 31, grew up in Lynwood, Ill., and played baseball for the Flames from 2000 to 2002 before being drafted by the Detroit Tigers. He had a career-high 43 home runs for the Yankees last year. Granderson’s donation, which wasn't disclosed, is one of the largest in UIC athletics history. In a news release, UIC Athletic Director Jim Schmidt expressed his appreciation for Granderson’s contribution.